It is sometimes referred to as visual poetry; a term that has evolved to have distinct meaning of its own, because the words themselves form a picture. This can be called imagery because you use your senses to figure out what the words mean. Another early precursor from Herbert is "Easter Wings", in which the overall typography of the poem is in the shape of its subject. Alice's Adventures in Wonderland by Lewis Carroll contains a similar effect in the form of the mouse's "Tale," which is in the shape of a tail. In the early 20th century, artists and poets comprising the Futurism movement used concrete poetry as a dynamic expression of their anarchistic philosophies. F. T. Marinetti was the most prolific poet among them, and created several works that destroyed all typographic conventions. More recent poets sometimes cited as influences by concrete poets include Guillaume Apollinaire, E. E. Cummings, for his various typographical innovations, and Ezra Pound, for his use of Chinese ideograms, as well as various dadaists. Concrete poetry, however, is a more self-conscious form than these predecessors, using typography in part to comment on the fundamental instability of language. Among the better known concrete poets in the English language are Ian Hamilton Finlay, Dom Sylvester Houédard and Edwin Morgan. A well-known concrete poet in the Hungarian language is András Petöcz. Several important concrete poets have also been significant sound poets, among them Henri Chopin, and Bob Cobbing. 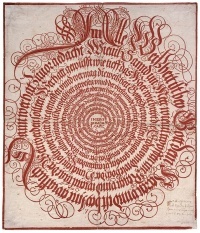 Another precursor to concrete poetry is Micrography, a technique for creating visual images by Hebrew-using artists who create pictures using tiny arrangements of Biblical texts organized usually on paper in images which illustrate the text used. As noted in the entry, micrography allows the creation of images of natural objects by observant Jews without directly breaking the prohibition of creating "graven images" that might be interpreted as idolatry. The technique is now used by both religious and secular artists and reportedly is also used by Arabic writer-artists. The French poet Pierre Garnier, collaborating with the Japanese poet Seiichi Niikuni, also used the term spatiality in relation to concrete poetry, implying that the white space between words also holds meaning. 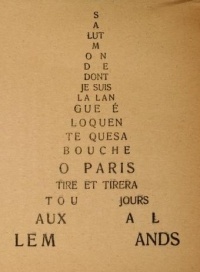 Mechanic, phonetic, semantic and visual poetry also approach the idea of concrete poetry. Poets emphasized that language is not only a means of communication, but that language also has a material dimension. New forms of concrete/visual poetry are still being created, such as the interactive and puzzle poetry by Jennifer Kathleen Phillips. Some of these contain poems within a poem or visual messages triggered by the sound or synergy of the shape of words and letters. Unless indicated otherwise, the text in this article is either based on Wikipedia article "Concrete poetry" or another language Wikipedia page thereof used under the terms of the GNU Free Documentation License; or on original research by Jahsonic and friends. See Art and Popular Culture's copyright notice. This page was last modified 23:06, 24 January 2014.